USDA Certified Organic Matcha Powder is a very traditional and unique form of what most of us westerners know as green tea. Japanese Organic Matcha is a fine green powder made from whole ground tea leaves, and is distinguished by its vibrant bright green color. What makes matcha so special is the way it’s grown and processed. The young shoots are shaded for 3-4 weeks, and after harvesting and drying, the stems and veins are removed from the leaf. These leaves, called tencha, are then ground into a powder with a specialized stone mill producing the final Organic Matcha powder. Because of the way matcha is grown and harvested, it has a more complex composition than common green tea. Matcha has a high caffeine content, but it’s tempered with L-theanine, an amino acid, that helps counteract the jittery effects of caffeine. It’s also has powerful antioxidant power due to the high content of polyphenols and Epigallocatechin gallate (EGCG). 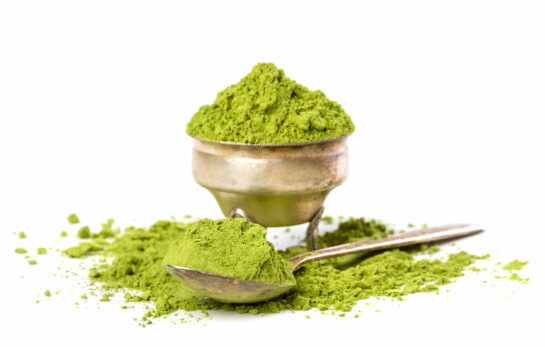 The combination of caffeine and antioxidants makes matcha a great ingredient for vibrant, bright skin! To use Organic on your label, you must be certified by a certifying agency. While the USDA Certified Organic Peppermint Toner in this recipe is preserved, this recipe has not been challenge tested for preservation efficacy. If you use this recipe for market sales, it is up to you to ensure the safety of the product. We strongly recommend 3rd party challenge testing. If you need additional help, please contact us at info@ewlnatural.com or 866-252-9639.